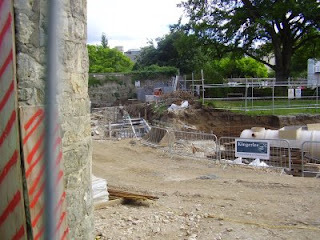 This afternoon I took a walk down to St John’s College to try to have a look at this archeological dig myself. 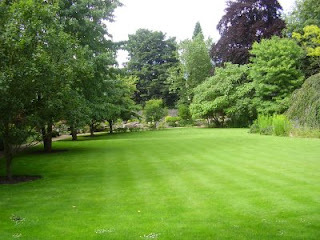 I walked round the exquisite garden in St John’s College, but found out that the artifact was discovered, as they so often are, on a nearby building site. It is at a development on Blackhall Road, about a hundred yards from the old St John’s campus. If this “henge” is really 150 metres across then it is one of the biggest in the country. This must mean that the land where Oxford now stands was once a major ceremonial centre. The bodies found in March may have been either ritual sacrifices or people buried there because of the energy fields of the local ley-line network. I approached the location of the dig only to find that is was fenced off. However I took some photos from as close as I could. As you can see, it’s visible both from the Blackhall Road side and through a small gap between two buildings on the St Giles side. 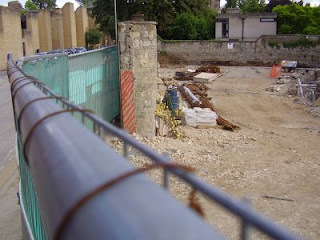 Archaeological finds in Oxford have a habit of being hushed up. A few years ago the pedestrian zone of Cornmarket Street was redeveloped, but one day I went up there to find that the ordinary builders’ fences had been replaced with opaque chipboard screens. Also several “bulldogs”, the University police, were guarding the entrance. 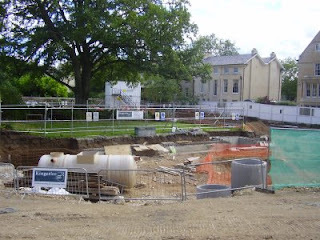 I found out later from the Oxford Mail and the Thisisoxfordshire website that the builders had accidentally exposed a previously undiscovered underground chamber just a couple of feet below street level and the University had moved in to investigate. The investigation team were a bit cagey about what they found, but they did mention “human remains”. This was the last we heard about the matter. A few months later I used the search function and the archive list of Thisisoxfordshire.co.uk to try and find the story again… but it wasn’t there! There have been other incidents. The Jolly Farmers is one of Oxford oldest pubs and the barman in it told me that there were several underground passageways and catacombs beneath it and the surrounding streets with access tunnels leading to the pub’s cellar, but that it was all a big secret. I tried to continue the conversation, but he was reluctant to give me details. Therefore I’m very glad I managed to get these photos; just in case they become the only record of what lies at the site. Good stuff, mate... Will check this out further. Nice one Ben, great sleuthing! Cheers, guys! :-) Respect to ya! Ellis mentioned that St John's is Tony Blair's old college. Makes sense. The energy fields of the place could well have been abused by the PTB's to ease the indoctrination of the students there. really, hate to burst the bubble but there's no conspiracy here. 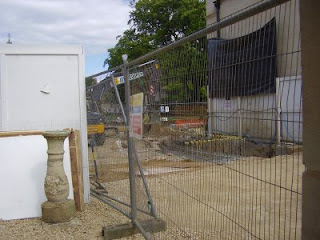 There are more photos of the site already in teh public domain (oxford mail and construction industry circulars), added to all the photos I and others took. They will be published, in a publicly archived and accessible report, and the originals (including all negatives) will form part of the site archive, and be stored at Oxford Museum (maybe take a few years though to get there, a lot of paperwork to get through first). There will also be a published report in a relevant archaeological journal (usually publishsed periodically). Failing that, a quick cal lto your local Sites and Monuments Records office should be able to help you further. I'd advise keeping a look out for these reports, you may find them even more interesting than you know. Oh yeah, the chipboard hoarding going up round a site with disturbed human remains in the middle of a pedestrian zone - thatts pretty standard. Its generally considered impolite/rude and in fact downright disrespectful to gawp at dead people, and we do have a legal duty to treat any remains with consideration. The fact that i personally consider all Oxford locals to be deviant mutated freaks doesn't mean they actually have multiple heads. Shame really, it'd be much easier to spot them.